For those who like military movies, a couple of key times of the year furnish them regularly. Expectedly, one is Memorial Day. The other is Veterans Day, and since Nov. 11 falls on a Sunday this year, Turner Classic Movies will devote a good portion of this weekend to themed films. Here's a look at highlights. “Battle of the Bulge” (8 a.m. today): Shown in Cinerama in some initial engagements, this 1965 drama (from director Ken Annakin, a specialist in big-cast epics) was of the all-star nature that many war movies of that era put forth, though former Gen. Dwight D. Eisenhower and others accused the makers of playing loose with facts. Several actors who also would appear two years later in “The Dirty Dozen” – Charles Bronson, Telly Savalas and Robert Ryan – were featured here, along with Henry Fonda, Robert Shaw and Dana Andrews. “Where Eagles Dare” (11 a.m. today): Written for the screen by adventure icon Alistair MacLean at the same time he prepared the corresponding novel, this 1968 saga of an Allied raid on a Bavarian castle boasts the interesting teaming of Richard Burton and Clint Eastwood, displaying vastly different performing styles. In fact, Eastwood goes through the picture virtually wordless, reportedly at his request. “The Great Escape” (1:45 p.m. today): Steve McQueen's (actually, stuntman Bud Ekins') motorcycle jump over a barbed-wire fence is the single most enduring image of director John Sturges' 1963 classic, based on the true story of a mass breakout from a German POW camp. James Garner, Richard Attenborough, Charles Bronson, Donald Pleasence, James Coburn and David McCallum play others in on the scheme. 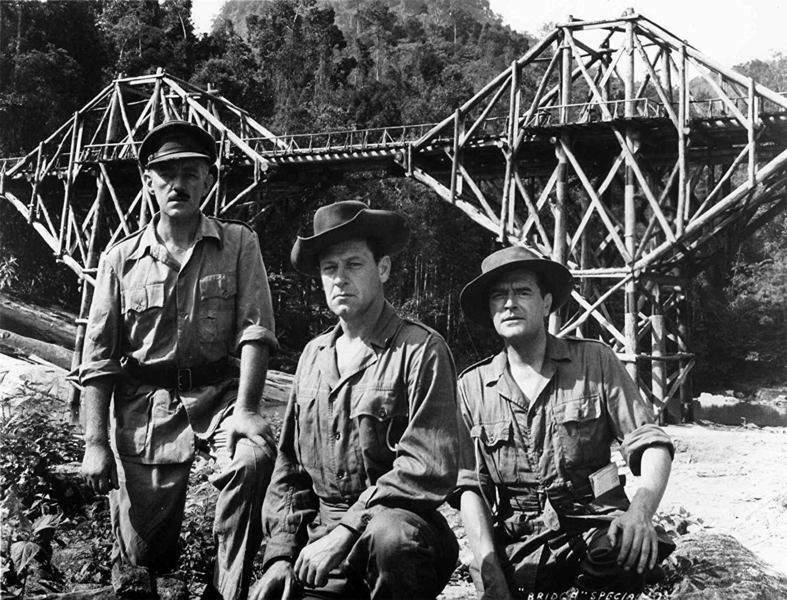 “The Bridge on the River Kwai” (5 p.m. today): With the whistled “Colonel Bogey March” as a major factor in its music score, director David Lean's Oscar-winning take on the Pierre Boulle novel involves an escaped Navy officer (William Holden) in a plot to destroy the Burma Railway while its construction is overseen by Japanese prison-camp officials and advanced by a captive British lieutenant colonel (Alec Guinness). “The Guns of Navarone” (5:15 p.m. Sunday): Gregory Peck, David Niven and Anthony Quinn gave substantial star power to another Alistair MacLean story, the 1961 story of another Allied assault on a German-held stronghold – this one housing the enormous title guns, certain threats to ships trying to rescue stranded British soldiers. “The Longest Day” (8 p.m. Sunday): Producer Darryl F. Zanuck's 1962 re-creation of D-Day boasted “42 International Stars” ... a claim that was hard to dispute when the huge cast handled by several directors (including the aforementioned Ken Annakin) encompassed such familiar faces as John Wayne, Robert Mitchum, Richard Burton, Sean Connery, Henry Fonda, George Segal and Robert Wagner.